Sciatica is term used to describe pain that travels (radiates) down the leg from the lower back or buttock. It is a type of nerve pain and a number of cases are caused by pressure on the nerves due to disc bulge in the low back. This is most commonly seen in middle-aged adults and men are more susceptible. The term sciatica originated from the sciatic nerve, which is the single largest nerve in our body. This nerve is responsible for a significant proportion of leg sensation and movement. Sciatica represents pain in the area supplied by the sciatic nerve. Radicular pain/ radiculopathy are medical terms which doctors use when describing this condition. There are numerous reasons for having leg pain and every leg pain is not sciatica. 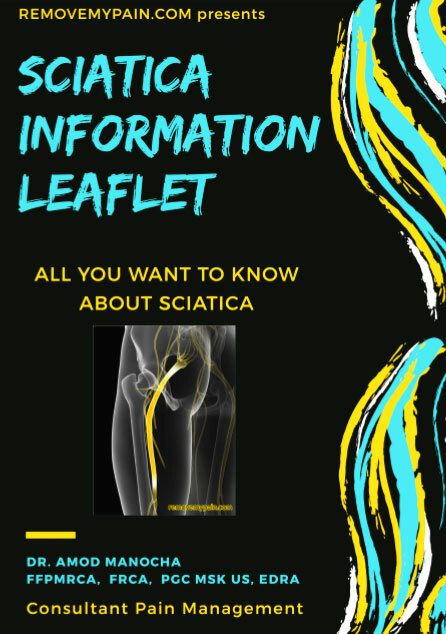 Commonly people misinterpret sciatica as a disease and need to be explained that it is a symptom of the underlying problem. 2. What are symptoms of sciatica? The severity and symptoms many vary considerably. In severe cases the affected individual may find it difficult to walk or even stand up straight. Muscle weakness with difficulty in weight bearing or walking. Buttock/low back pain and stiffness. Disc herniation: Spine is formed of many bones called vertebrae arranged one above the other. In between these vertebrae are discs, which are like cushions or shock absorbers. The discs are made up of an outer tough substance and an inner soft jelly like substance. Herniation of the disc can occur if there is splitting or crack in the outer layers allowing the inner jelly like substance to protrude through the crack. This can cause inflammation and compression of the nerve roots in the vertebral column. Slipped disc is a commonly used term for this condition. There is an increased susceptibility to disc herniation as we age because the soft, jelly like substance dries out and shrinks with time, making the disc more fragile. Spinal stenosis: Stenosis means narrowing. The narrowing can be of the central canal of the spine or the passageways/ tunnels from which the nerves exit the spine. Besides disc problems, arthritis of the spinal joints or thickening of ligaments can also cause/ contribute to the narrowing. Spondylolisthesis: In this condition there is a problem with the alignment of vertebrae, where one vertebra is more forward or backwards, which can narrow the spaces for nerves and produce sciatica as a result. Piriformis syndrome: In this condition piriformis muscle in the pelvis is responsible for pressure on sciatic nerve. 4. Can it resolve on its own? Fortunately most cases of sciatica resolve within a period of weeks to months with conservative treatment. Specialist input and treatment can help. Painkillers, heat or cold pack, altered activity levels and physical therapy may be suggested depending on your condition. An injection of steroids into the epidural space within the spine can provide short-term pain relief in sciatica. Persistent pain can lead to changes in the nerves (referred to as plasticity). This can be a source of persistent pain even if the original inciting event is resolved … hence the importance of managing these sooner than later. Having seen numerous cases over the years, I would say that it is not easy to predict the course. It can resolve but to what extend depends on numerous factors- some are modifiable and others are not. The recovery period varies from individual to individual. 5. What are the warning signs I need to be watch for? 6. What can I do to reduce my risk of having sciatica? 7. What investigations are generally considered for sciatica? Your doctor may request for investigations such as magnetic resonance imaging (MRI) scan and blood tests. Sometimes computerized tomography (CT) scans may also be required. X-rays are not as helpful and they can provide only limited information. Bulging discs on an MRI scan are not an uncommon finding. It is important not to get fixated on the MRI findings. A bulging disc is not permanent and can reverse. The investigation results should be interpreted in combination with patient history, examination findings to assess their significance.A number of patients with severe MRI findings may be asymptomatic and vice versa. 8. What are the other treatment options? Sciatica is different from common ailments we all suffer and hence taking professional help is recommended. Your doctor can help to confirm that you have sciatica and help identify the cause. A range of different options- non surgical (such as injections- nerve root blocks, epidurals, piriformis injection etc) or surgical may be considered. There is no one solution for sciatica pain and the options are numerous – some with good evidence and others with not so robust evidence. Generally a multimodal multidisciplinary approach is preferred as this helps in addressing not only the pain but also the impact of pain on one’s life. I ensure that the patient understands the nature or problem and the do’s and don’ts. Time spent in explaining the conditions and the expected course goes a long way in fostering realistic expectations. I generally use a combination of the modalities mentioned below to enhance the chances of quicker recovery. This includes drugs such as DIclofenac, Naproxen, Aceclofenac, Ibuprofen etc. NSAIDs are prescribed to reduce the pain and inflammation during periods of acute sciatica although the evidence supporting their use is not very robust. The risk benefit ratio needs to be evaluated while prescribing any drugs. This group includes antidepressants and anticonvulsants both of which are well known painkillers for nerve pain. It generally takes a few weeks for the full effects of these drugs to become apparent. Effects such as reduced anxiety and sedation can be used beneficially by tailored selection to suit individual patients. Their use is supported by the NICE guidelines, UK. Weak opioids such as tramadol are often prescribed during pain flare up episodes. It is a good practice to be aware of the side effects of a medicine prior to using it. These are used for short duration to relieve any muscle spasm contributing to the back pain. The use of epidural steroids/ Nerve root blocks has been shown to have beneficial improvements in leg pain and disability scores in short term. Steroids help by their anti-inflammatory and analgesic (pain relieving) effect. Epidural steroids are preferred to oral steroids as they are given close to site of actual problem and have less adverse effects. Physiotherapy is an essential component of sciatica treatment. Your physiotherapist can help with posture advice, do’s and don’ts relevant to your condition, understanding the concept of pacing of activities, setting practical goals, teaching strengthening exercises for core, leg muscles and manual handling techniques. If a combination of above fails to provide adequate relief then surgical options such as discectomy (operation to remove bulging part of the disc or separated disc fragments) and microdiscectomy can be considered for sciatica resulting from disc bulge. Surgical options will vary depending on the cause of sciatica and sometimes may be the first choice, depending on the actual pathology and its severity.